We just wrapped up another long weekend in Canada which explains my absence yesterday. It kind of snuck up on me as did the month of August! I always find this month goes by way too fast and no matter how many years I have been out of school I always feel I should be preparing for the start of a new year. One of my readers, Janet is also getting things organized. She recently asked me to help her out with some suggestions for her kitchen window treatment. I immediately thought this would be an ideal Cast Your Vote question since you all have such wonderful ideas and suggestions. Janet moved into her house a few months ago and like so many first time homeowners has a long list of repairs and updates to do to the house. She has plans for a complete kitchen overhaul in the near future but for now she is making the most of what she has. Janet sent along these two photos from the always inspiring Making It Lovely blog as examples of what she is hoping to achieve. She wants to add a touch of fun and colour to her neutral kitchen and thought the window was a great place to start. This bright yellow window shade really does bring the room to life. You can see how Janet would be inspired to add something similar to her own kitchen. You could see how a burst of colour and pattern would really bring this kitchen alive. I think yellow graphic patterned blinds would also work really well in this space. This print called Emilio Lemon Drop print from Tonic Living is fun and bold. I also think this Gate pattern in Citrine from DwellStudio is lovely. In fact, it might be my favorite. I think the subtle touch of warm grey in the print would really tie the kitchen all together. I found these two prints called Chelsea also at Tonic Living. I think either of them would work well in the space. Like above, that touch of warm grey will reference the colour of the kitchen cabinets making the space feel complete. 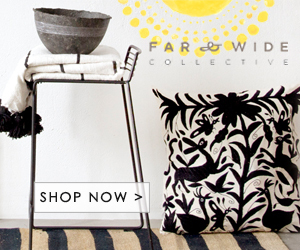 If Janet wants to keep the whole colour scheme neutral she could go with either of these prints from DwellStudio. The first one is Maze Work in Dove, the second is Soft Scrolls in Charcoal. But why would you want to stay neutral when you could add a delightful print like this one! I think Janet's kitchen would really benefit from an injection of colour; something like these Poppies from Tonic Living. Or how about this contemporary floral called Madison Wisconsin from the Spring 2010 line by Marimekko. I think this might be my second favorite. This more traditional garden print called Sweet William in Teal from Tonic Living could also work. Finally, you can never go wrong with this famous print called Unikko by Maija Isola for Marimekko. They also have an amazing line of plates, cups and bowls that would compliment the fabric nicely. So what do you think? Would one of these fabrics work for Janet's neutral kitchen? Is there something out there you think would work better? Cast your vote and let her know what you would pick!